TO EDUCATE, SUPPORT AND INSPIRE THOSE WHO ARE READY IN THE QUEST FOR INCREASING VITALITY AND QUALITY OF LIFE. Our goal at Inspire Wellness is to bring you to an invigorating yet relaxing environment to allow education and healing to occur. Your body has the innate ability to heal if given the opportunity. We help you figure out what your body needs more of and what it needs less of so that balance is restored. Providing your body with optimal nutrition and opening all detoxification pathways is the foundation of what we do. Even with the best intentioned eaters, supplementation of nutrients, both oral and intravenous, is often helpful. There is no one size fits all nutrition plan. Likewise, there is no one size fits all detoxification plan. Each treatment plan is tailor made after listening to your story, obtaining lab data and putting together the pieces of your puzzle. This level of thought, problem solving, and education takes time. The doctors at Inspire Wellness know this, and will provide as much time as needed to understand you, your current situation, and your life goals. 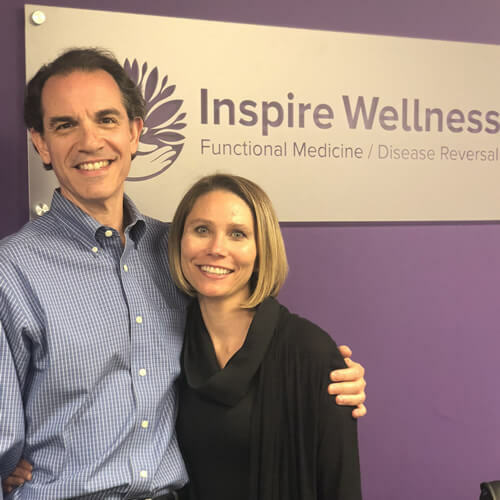 As we take the first step by creating Inspire Wellness and beginning our journey with you, our patient, we also want to attract like minded professionals who understand the value of disease prevention and reversal and the value of belonging to a conscious business. As a community, this is the path we all have to walk along to sustain our health in this failing medical system. It’s your time to thrive ~ let us INSPIRE you!